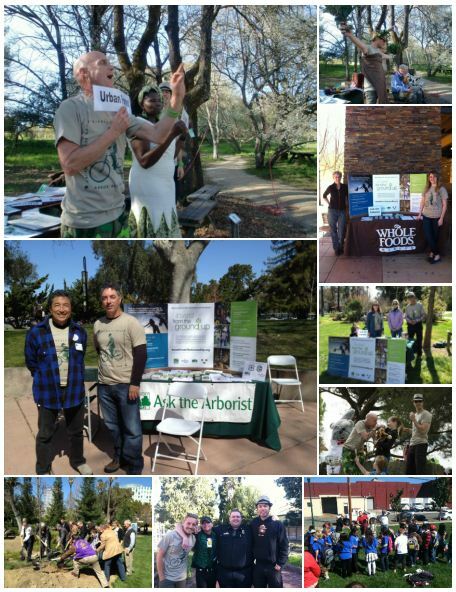 Our 2012 California Arbor Week Tour was a BLAST! Sponsored by CalFire and The Britton Fund, we were able to visit 18 sites in 11 days. We went from historic landmarks to elementary and high schools, from Fairyland to Whole Foods, spreading the word about the importance of our urban forests. The TreeCircus paid special tribute to Luther Burbank on this tour. Burbank, whose turn of the century farm experiments changed the food we eat, is the only person to have a state’s Arbor Day celebrated on his birthday. In 1906 the California Federation of Women’s Clubs passed a resolution requesting arbor day to be named after Burbank, and the proclamation was signed and established 1909 by governor James N. Gillett. The California State Assembly and Senate have established March 7-14 of each year as California Arbor Week. California Arbor Week is an opportunity to unite homeowners, cities, businesses, and individuals and to educate Californians on the value trees provide to building successful, healthy cities and neighborhoods. An important message every day of the year, March 7-14 is a chance for Californians of all ages to celebrate our natural wonders and most treasured resources together. Learn more about Arbor Week at www.CaliforniaReLeaf.org.